In 1985, this top secret military base was finished after 4 years of construction and started to fulfil it's strategic role for the eastern communistic block. It is situated on south-west from Prague, Czech republic, in area called Brdy. Here you can see the aerial view of the place. Already during it's operational time people started to call it "Klondajk", while the official name was "Anti-aircraft rocket group VEGA Dobříš". As the official name suggests, the main deadly instrument operated there was a soviet rocket system S-200 VEGA. The base itself was divided into 3 main sectors. In sector A there were accommodation buildings, offices, kitchen and generally it was the area where soldiers were living while not being in alert. Sector B was a vehicle operations area. And finally the biggest one, sector C was a rocket operations area. Nowadays the sectors A and B are used as a scientific center and photovoltaic power station. The most interesting rocket operations area is a private property with restricted access. So do not ever go there. There were 3 anti-aircraft rocket units on the base during communism, each equipped by the same combat rocket system S-200 VEGA - rocket launch pads and shelters, target detection and tracking radars, illumination guidance radars, of course the rockets (type 5V28) and other supporting technologies. All those units were supported by several facilities inside the sector C. Each unit had 6 launch pads available with heavy duty or light shelters for two rockets. It means that this base could fire 36 rockets in very short time in case of battle emergency. That is the theory. In practice - and actually for the whole operation carrier of this base - only four rockets in the same time were loaded in standby mode...fortunately it was never necessary to load all 36 ones. And why only 4 during peace times? The rocket itself was very expensive and since it was filled by very aggressive fuel, it wasn't a long-life product. The most important part of the system S-200 VEGA was the rocket 5V28. Quite a beast we can say. 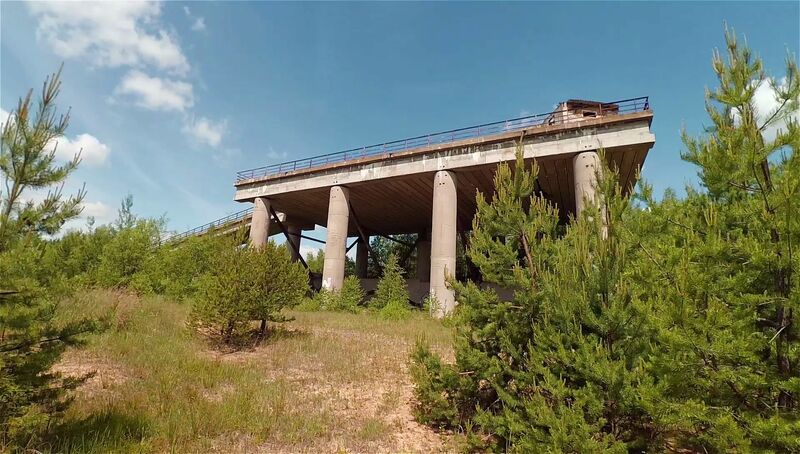 Ultimate 3D walkthrough documentary movie from former military rocket base located in Brdy area, Czech republic. Over 18 minutes of real 3D footage is ready to be played on any 3D television or virtual reality (VR) mobile headset. Free download & YouTube links are in the end of this article. Support this real 3D videos project and name your price from $2 on Gumroad. The price excludes VAT. It will be added to the price based on your actual geographical location. Klondajk 3D walkthrough guides you thru the sector C, starting around small warehouses for solid-fueled rocket boosters (engines for the first few seconds after launch) and explosive charges. Garages and open parking places for manipulation machinery and the heavy vehicles which were used for the rockets transportation. Rocket system S-200 VEGA was originally constructed as a mobile one. There were no solid command rooms, the command posts looked like a standard garages for a truck, with connectors for communication cables. Command rooms were mobile cabins with all the technology inside. Each cabin was transported there by a truck, connected to the infrastructure and closed behind heavy duty steel doors. Here you can see the post for all 3 command cabins. These "bridges" are definitely the most interesting constructions of the whole base. The illumination guidance radars were placed there. The rockets had quite sophisticated aiming system - the ground guidance radar kept illuminating the aimed target and the sensors inside the rocket's nose followed this reflection. And then, in close distance from the target, the warhead exploded. It was very important not to interrupt the illumination ray from the radar to the target during the rocket's flight. In the other words, the radar needed to see the target all the time after launch. And that's why the illumination radar had to be at some raised position, above other buildings and tree level. The radars were also mobile as the whole rocket system, so there had to be a way for a truck to climb there. Next to each radar bridge a reinforced position (garage) for radar control cabin was built. Here you can see one of the 18 launch sites - shelter for two rockets and loading carriage rails from each position towards the launcher. The launcher itself was grounded into the square hole, currently overgrown with bushes. Process of loading the missile from the shelter to the launcher had to be fully automated. It was due to conditions at the place after launching the first rocket - the site was uninhabitable for few minutes for anything alive. 5V28 rockets were powered by dual-thrust liquid-fueled motor. Both fuel componets were heavily aggressive and dangerous. The rockets had to be filled by the fuel very carefully. Here was the place for this procedure, covered by special acid-resistant ceramic floor tiles. This is the biggest shelter at the rocket base. Here is the place where 34 rockets 5V28 were stored and waited for being refueled and launched. Fortunately they never live to see that happen. The reinforced shelter has two tubes with doors on both sides. And notice the large space in front of the doors - the transport trucks had to move and turn comfortly there. Here you can see the rocket service building. The ceiling crane looks like it finished doing it's job just few days ago. But actually it is many years... Anti-aircraft rocket group VEGA Dobříš was dissolved in 2001. If you can handle "parallel-viewing" method, you can check the following actual movie screenshots and see them in 3D.